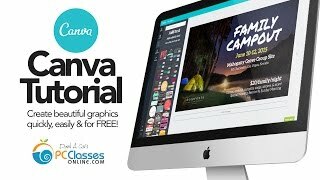 If you’ve ever needed to make a graphic for anything from a poster or business card to a slide or image for Facebook, you really need to check out Canva.com. Canva is a FREE online design program that you can use to make all kinds of different images quickly and easily. For today’s lesson I’m going to walk you through creating a sample slide advertising an upcoming family campout sponsored by a local church. As I create the slide, you’ll learn how to set up your project, add a background image, create and resize text as well as choose text colors and even line spacing. You’ll also learn how to duplicate an item, move things around on the canvas, and then how to save and download your finished project. Today’s class is just to get you started with the basics, but Canva can do much more, so go create an account and check it out. If you have any questions, let me know in the comments below. http://www.jfl-media.com/en/wp-content/uploads/2018/06/RW84o3.jpg 180 320 Barbara C http://www.jfl-media.com/en/wp-content/uploads/2018/12/training-adobe-corporate-media.png Barbara C2018-06-11 23:52:212018-06-11 23:52:21Canva Tutorial: Create Beautiful Graphics Quickly, Easily, and for Free! created a graphic and saved it but how do I know where to find it? also how do I create a NEW graphic without adding on to the original? That was great! Thanks so much! Only great speakers are as fluent as you are and so perfect. How do you do that? Do you practice a lot? The video is so great. Indeed this is an informative class. Though I have been using Canva for some time, this post helped me to know more on creating images for my web/blog pages. @ pvariel.com I just subscribed and waiting for the next class. Thank you so much!! Very useful. Amazing review, SIKE THATS THE WRONG NUMBA! I like to use Canva too! It is an awesome tool! Great explanation and graphic demonstration. how do u type in a circular path? Great video. I love Canva as well. Such a simple tool, and I love that it’s online so it goes everywhere with you. all i need is to know how to change the colors on a damn shape the rest is basic. i wish i could afford photoshop. Thank you so much! I liked the tutorial, it is very useful. Man, thanks so much for this quick tutorial David. I have been creating flyers from scratch in pwpt and word for ever!! i made an image on canva and don’t know how to dowload it to my computer or pinterest.Can anyone help please? Thank you ! that is very cool! I recently discovered Canvas. Thank you 4 sharing. i don’t have a download button on my screen, am i on the wrong page? It was helpful, and all, but where did you get the premade text layouts? When I used it, I didn’ see any of that. Thank you for a awesome video.! Do you have any ide why canva, make kaos in the text and it translate the text into english?? this is excellent! I am looking forward to having some fun creating all sorts of stuff with Canva! thanks so much for sharing this how to. Thanks so much. This is an awesome tool! David is this the only site yu recommend for free prof. graphics? can I create thumbnails with this program? I’d like to know how to make that angled photo with the MAC screen at the end of your video. Similarly, the angled ebooks that people use sometimes. Thanks! Great video. Absolutely fantastic tutorial thank you.